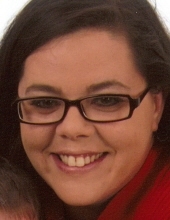 Christina L. Murray, 37, of LeClaire, Iowa died Sunday, June 11, 2017 at Trinity Rock Island. A celebration of life will be held at 10:30 a.m. on Saturday, June 17th at Our Lady of the River in LeClaire. All are invited to stay for a luncheon following services. In lieu of flowers, memorials may be left for the family to help with expenses. Quad Cities Cremation Center assisted the family. Christina Lynn was born June 15, 1979 in Davenport, Iowa a daughter of Scott Sr. and Julie A. Noll Murray. Tina enjoyed fishing, reading, baking and spending time with family. She was a member of Our Lady of the River, LeClaire. Those left to cherish her memory are her sons: Kyle Jacob Rico, Bettendorf, IA and Christopher Allen Rico, LeClaire, IA; parents: Scott Sr. and Julie Murray of Grand Mound, IA; siblings: Stephanie (Richard) Shook, LeClaire, IA and Scott Jr. (Samantha) Murray, Princeton, IA; grandparents: Carol and Kenny Keckler, Davenport, IA and nieces and nephews: Bailey (William) Johnson, Tanner and Hunter Murray and Kaiden and Kaylee Shook. She was preceded in death by her grandparents: Jim and Doris Murray and Donald Noll. Online condolences may be left at illowacremation.com. To plant a tree in memory of Christina Murray, please visit our Tribute Store. "Email Address" would like to share the life celebration of Christina Murray. Click on the "link" to go to share a favorite memory or leave a condolence message for the family.